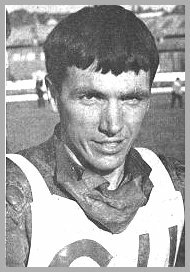 Often spectacular, equally as determined and always value for money, Brian Brett was allocated to Cradley in 1967 with an impressive pedigree already behind him. It was to be his only season at Dudley Wood as the Heathens only managed 18th place in the British League, a marginal improvement on the previous season. Brett started out over ten years earlier in 1956. He grew up on the terraces of Rye House and made his shale debut just short of his 18th birthday. After spells with Southampton and Belle Vue in the late fifties, he settled at Swindon where he made his name between 1960 to 64. Starting out as a very ordinary bottom end rider, under the guidance of his mentor Mike Broadbanks, he steadily improved into a quality heatleader. Despite reaching the British Final in 1964 and flourishing into a regular reliable scorer in the Robins line-up, Brett announced at the end of that season that he was to retire to concentrate on his Industral Cleaning business and his family in London. He managed to stick to his decision for the start of the '65 season, but when Newcastle promoter Mike Parker came with a request to solve the injury situation partly created by Ivan Mauger's fractured ankle, it was an offer Brian couldn't refuse. He went on to become the Diamonds top scorer for the year, as well as Britain's top man in the World Championship. 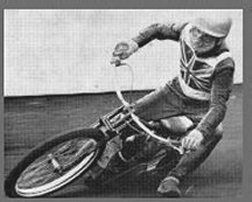 By now a regular international, he stayed with Newcastle for the start of 1966 and despite being hit by injury, he battled on to more than 250 league points for the Brough Park outfit. And so it was with significant achievement already notched up that Brian eventually came to Cradley, joining the likes of Ivor Brown, Chris Julian and Tommy Bergqvist in the team in June. Jack Biggs and Jack Scott had both departed and the Heathens had made an altogether shaky start to the season. After taking a few weeks to settle in, Brett began to clock up some enormous scores. As injuries to Brown, Bergqvist and the on-form Graham Coombs decimated the team, the Hertforshire rider stepped up. 17 points in the home leg of the Dudley-Wolves Trophy could not prevent the aggregate victory going to opponents, but a continued succession of double figure scores between July and September ensured Brian lived up to his potential and reputation. 1967 turned out to be Brian's only season with the Heathens and his last in the sport, as he retired in February '68. Photo's courtesy of Speedway Star. Brian sadly passed away in November 2006 following a heart attack.